“It is my privilege to inform you that you have been named a Fellow of the John Simon Guggenheim Memorial Foundation.” Quote taken from the official letter to the recipients of the 2011Guggenheim Fellowship Award. Janet Kurnatowski Gallery is pleased to present 2011 Brooklyn Guggenheim Fellows, a group exhibition exclusively devoted to artists who work and have strong affiliations to the Brooklyn art scene. 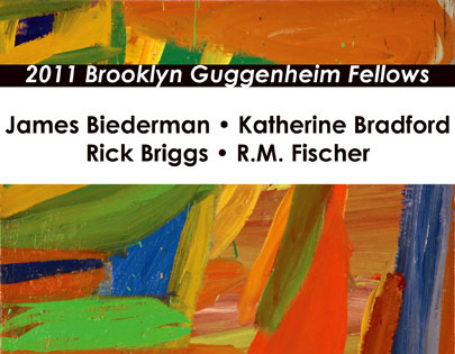 Moreover, all included artists were recipients of the prestigious 2011 Guggenheim Fellowship Award: James Biederman, Katherine Bradford, Rick Briggs and R.M Fischer. 2011 Brooklyn Guggenheim Fellows runs from April 27- May 27, 2012, there will be an opening reception on Friday, April 27 from 7-9pm. James Biederman makes gestural paintings that reflect his lived experiences. His palate ranges from deep earthy tones, to lush vibrant and chromatic hues. In addition to his artistic production James Beiderman has been a vital figure in the Brooklyn community. As founder and curator of N3 Project Space in Williamsburg Brooklyn from 1998-2004; he was able to provide a sophisticated and relevant platform for talented and under-represented Brooklyn artists. James Biederman is represented by Janet Kurnatowski Gallery and has been a recipient of the Joan Mitchell, Adolph Gottlieb Awards. He exhibited in Documenta 7 and is in collections of MOMA, The Metropolitan Museum of Art, Pompidou, and Kroller- Mueller. Katherine Bradford’s work portrays symbols of masculine strength that subvert the stoicism and force traditionally used to describe the heroic. Bradford combines imagination with the immediacy and joy of the painting process. She is represented by Edward Thorp Gallery and has works in various public collections including The Brooklyn Museum of Art, The Metropolitan Museum of Art, Portland Museum, Addison Gallery of America Art and Worcester Museum. Rick Briggs's self-referential work first gained serious attention with the series "Painter Man", which humorously depicted a house painter/artist locked in a life and death struggle with his day job. More recently, Briggs has been busy depicting his history as an abstract painter while at the same time, making abstract paintings with his house painting tools. In this way, he is broadening an on going discussion about the nature of painting. He has exhibited at the Brooklyn Museum, Paula Cooper, Yale University, and throughout NYC. He is also a 2012 Pollock-Krasner Foundation Fellowship recipient. R.M. Fischer’s sculptures have always rejected strict definition, hovering between the traditional boundaries that divide the worlds of art, design, and architecture. With his recent work Fischer continues to explore these boundaries. Recent work includes hand sewn and polyester filled vinyl, fabric and felt. R.M Fischer has numerous permanently installed public works across the country and is widely exhibited from New York to L.A.